The Undertaker last appeared at WrestleMania 33 in April. He lost to Roman Reigns. WWE played it up as Undertaker’s last match. On Monday night, he returned to WWE Raw last night for Raw 25, an episode celebrating the show’s 25th year on the air. It was lame. The whole thing was. 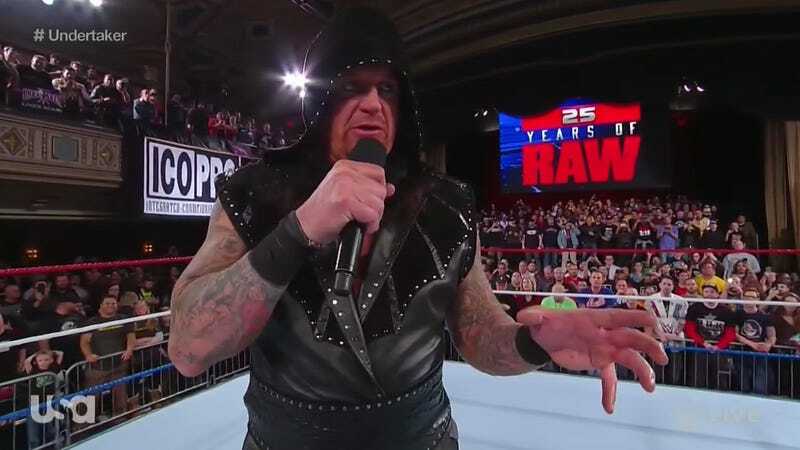 But Undertaker’s segment, which was held at the Manhattan Center, was a real drag. (The show alternated between the Barclays Center in Brooklyn and Raw’s original venue in Manhattan.) He talked and talked. It was just boring. In his late-career role as an annual attraction, Undertaker works, when he works, because of his opponent. A solo segment featuring the Undertaker with a microphone is not a good idea. Undertaker was not the only legend to appear at the anniversary show; as with the rest, he never quite went away enough for the return to have much of an impact. We’d seen the Undertaker in 2017. Ditto Shawn Michaels, Triple H, and JBL. Christian had a show on the WWE Network until last year. The Dudley Boys were wrestling in WWE in the summer of 2016. The New Age Outlaws were tag champs as recently as 2014. And can Ron Simmons get a line other than “Damn!” for once? Sure, it was neat to see some old guys. Brother Love was there. So were Harvey Whippleman and The Boogeyman. Ted DiBiase’s laugh is still great. Mean Gene Okerlund interviewing A.J. Styles was fun. But this show was a snoozer. It started so well, too. The opener was actually the template for a great retro segment. Steve Austin, who hadn’t appeared since WrestleMania 32, interrupted a McMahon family squabble. Austin hit the Stone Cold Stunner on Shane, Vince, and then Shane again. It was the only great segment, and most everything else was just OK at best. The DX segment was almost as boring as the Undertaker’s speech. The Godfather/Mark Henry interaction was stupid. The previous two weeks of Raw had been excellent, and then we had a crappy go-home show for the Royal Rumble. It happens. But maybe WWE needs to tweak its retro Raw format. Old wrestlers don’t disappear anymore; they just leave the ring for a long afterlife of comic conventions and Twitter interactions. It’s worth noting that the first episode of Raw sucked, too. The Undertaker headlined the show against Damien Demento. Koko B. Ware lost to Yokozuna. Shawn Michaels defended his Intercontinental title, but against Max Moon. Announcer Rob Bartlett misidentified Doink the Clown. Vince McMahon, forgetting the name of the wrestler in his employ, actually agreed with him: “That’s Dork. What a name for a clown: Dork.” Kamala turned babyface. Actually, this doesn’t sound too bad when I write it out. By the time Raw’s been on for 50 years, maybe last night’s episode will have aged well, too. WWE Network Is Better Than Ever, But Does WWE Even Know Why?